Final report published January 15th, 2009. See section SED. Stratospheric Census has been accepted to the 19th ESA Symposium on European Rocket & Balloon Programmes, which will take place in Bad Reichenhall, Germany, 7-11 June 2009. The team will present its concept of collecting and measuring aerosols in the stratosphere. Swedish Prime Minister Fredrik Reinfeldt informed himself about the activities at Space Campus in Kiruna during a visit on Wednesday, 11 February. Stratospheric Census was represented by Martin Siegl and Gerrit Holl. They explained the experiment in a brief talk and emphasized the fruitful cooperation between IRV, IRF, ESA and ESRANGE that had led to a successful flight. 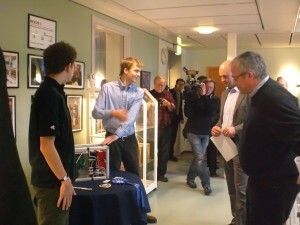 Foreground, from left to right: Gerrit Holl, Martin Siegl, Prime Minister Fredrik Reinfeldt and Hans Weber (IRV) ( photo by P.
Final report published - Science continues! team has published its final experiment report January 15th, 2009. A final presentation has been held on January 13th, 2009 for an audience of students, supporters and supervisors at IRV in Kiruna, Sweden. aerosols of volcanic, cosmic and anthropogenic sources. The team has experienced a year filled with an exciting, demanding and very rewarding project. Work on the scientific aspects of dust in the stratosphere will continue! The flight trajectory of BEXUS-7, carrying Stratospheric Census and other experiments, had its starting point at ESRANGE near Kiruna (Sweden) and ended in a landing near Rovaniemi (Finnland). Google Earth (TM) allows a 3-D visualisation based on GPS data. In the above image, the trajectory is color-coded based on altitude. The ascent and descent phases (yellow/green/blue) and the floating phase (purple/dark blue) of the balloon can be observed. The floating phase was at a height of approximately 27 km. The image below has ESRANGE in the foreground and Rovaniemi in the background. The blue segment of the trajectory indicates where Stratospheric Census was taking its dust sample (”Experiment Mode”). Along the green segments, the filter was sealed off (”Stand-By Mode”). A small article about Stratospheric Census was published in Visionsbladet/Annonsbladet, a paper that goes to all Kiruna households. Five international space students recently carried out a successful experiment on the student balloon BEXUS-7. With financial support from PROGRESSUM, they had built a “vacuum cleaner”, catching dust particles during the flight. These particles will now be analyzed. 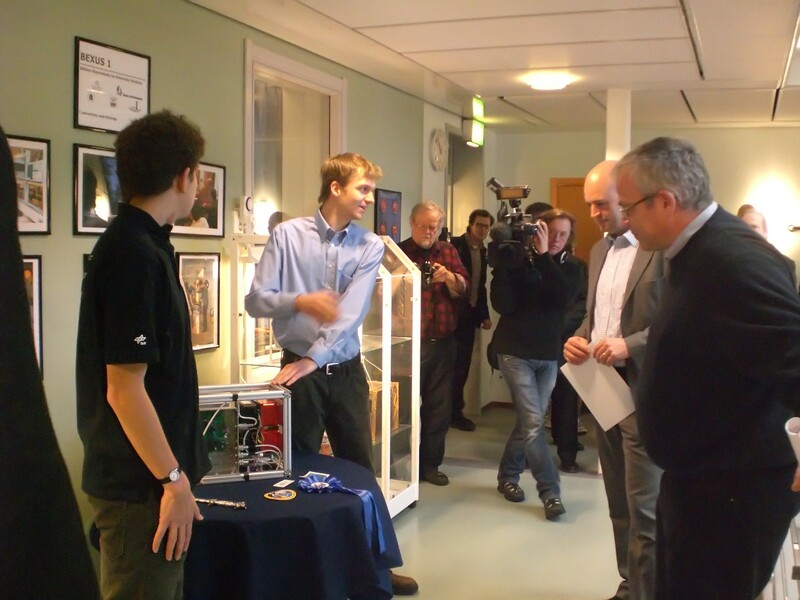 In a press release they thank all space-related institutions in Kiruna which had all been of great help. They think that Kiruna is the ideal place for space studies and decided to stay another year. 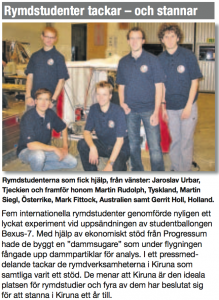 Five students from Kiruna launched a scientific experiment on the BEXUS-7 balloon from ESRANGE last week. “Our idea was basically a vacuum cleaner, we collected dust in the air, up to 27 km above the Kiruna region”, says Martin Siegl, one of the team members. 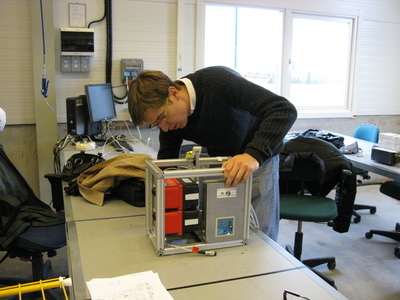 He had built the experiment together with four other friends at IRV and IRF in Kiruna. The team had found excellent facilities there. “But the project would not have been possible without the financial help we got from PROGRESSUM”, Siegl points out. “The team would like to take this opportunity to thank everyone who worked with us, especially our supervisors and the staff at IRV, IRF and ESRANGE for their input and help, even in stressful situations.” The campaign itself was organized and financed by a cooperation of the ESA Education office together with Rymdstyrelsen, Rymdbolaget and German DLR. During the flight of their experiment - the students called it “Stratospheric Census” - it passed a layer of dust from a volcanic eruption. “We are very excited about this and now we are looking forward to the analysis of our results.” Just like in a vacuum cleaner, the students had used a pump to generate an air stream and a filter to collect dust particles. This filter will now be examined, after it had been recovered from the balloon’s landing site close to Rovaniemi, Finland. “Luckily we didn’t land in a lake, we were just 2 meters away from one”, says Mark Fittock who had worked with the mechanical aspects of the setup. The whole team, people from Germany, Austria, Netherlands and Australia agrees that Kiruna is the ideal place to be a space student. ” ESRANGE, where we launched, is close by. They have experience in getting experiments off the ground. IRV and IRF have the expertise to build them. And PROGRESSUM made all of that possible with its support to us,” they say. The team of Stratospheric Census is looking forward to many more exciting projects! 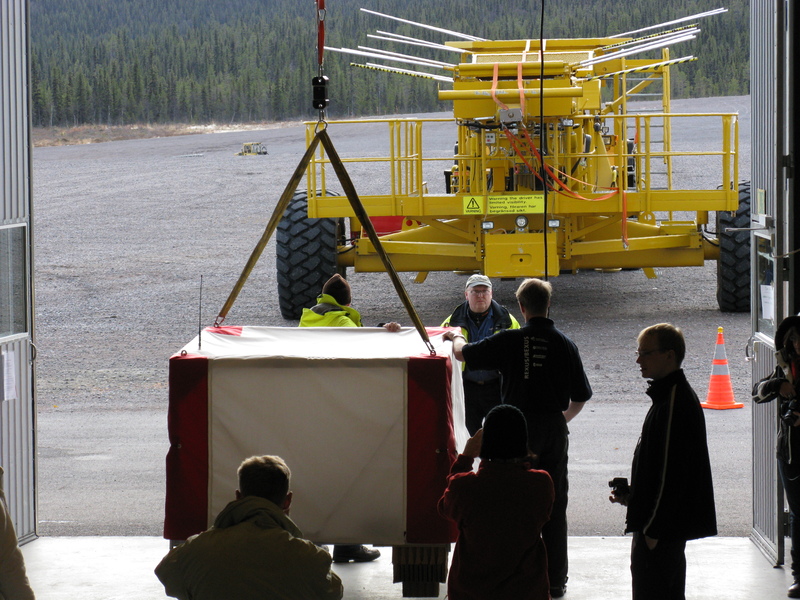 Bexus-6 and Bexus-7, the latter carrying Stratospheric Census, arrived at Esrange around 9:00 this morning, Friday 10 October. The Stratospheric Census team has dismounted the experiment from the gondola and is presently dismounting the filter, to be transported cleanly to the Institute of Experimental and Applied Physics, Czech Technical University, Prague, Czech Republic. Martin Rudolph inspects the experiment upon recovery. BEXUS-6 was found “screaming in Finland”. BEXUS-7, carrying Stratospheric Census and a number of other student experiments, has landed at 19:30 CEST at 66° 39′ 52.56″ N, 25° 39′ 45.72″ E) north of Rovaniemi, Finland. It will probably return to Esrange on Thursday. a cleanbag will be a acquired for the filters to be carried to the Czech Republic for analysis. It is now floating through the stratosphere, collecting particles of volcanic and cosmic origin. The trajectory can be followed here. The final tests for the Bexus-7 payload are being carried out. The E-link, the payload’s communication system, is now up and running. 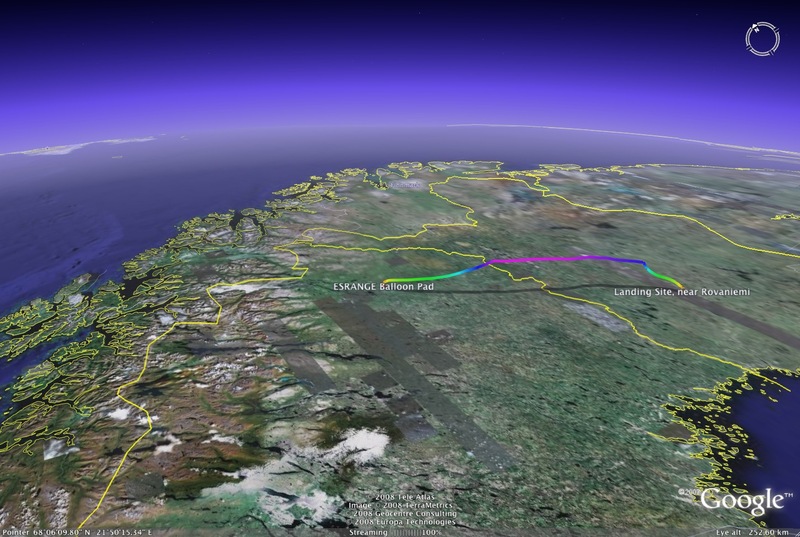 After launch, it will be possible to keep track of the trajectory live via balloon.esrange.ssc.se!